Find hotel near Kuttikattu Sree Bhadra Ka .. This unique temple is located within a small town, named Cherthala within Alappuzha district. It is one of the rare temples is South India that is dedicated to Goddess Bhadrakali. Nearly thousands of pilgrims come here to offer their prayer. The famous festival celebrated in this temple is Kunguma Khalasam. This festival is celebrated on the first Sunday of every month. People from all over Kerala comes here to offer prayer for the well-being of their children, for health, wealth and prosperity. Another unique festival celebrated over here is named as Serpent-worship. 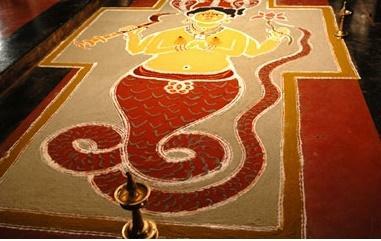 In this festival, Naga devatha (Serpent God) is worshiped. It is held during the annual ceremony Sarppam Pattu. So, visit this temple during one such festival to see how the rituals are performed. It is best to visit the temple during morning hours or early evening hours. For pooja timings, ask the temple authorities. How popular is Kuttikattu Sree Bhadra Kali Devi Temple? People normally club together Kumarakom Bird Sanctuary,Vembanad Lake And Pathiramanal Island and Sree Venu Gopal Swamy Temple while planning their visit to Kuttikattu Sree Bhadra Kali Devi Temple.